Happy 70th birthday to Israel. Celebrations have begun in Israel and Jewish conclaves throughout the world, at least most. Believe it or not, there are some Jews who believe the rebirth of Israel was the worst thing to happen to the modern world, like Bernie Sanders and George Soros. They disagreed with their very own prophets; and they disagreed with their very own God. Despite these Zionophobes and the many anti-Semitic roadblocks presented by the corrupt United Nations, Israel lives on. It has not been easy. Thanks to Arthur James Balfour, the impetus to restore the country of Israel got a big push in 1917. 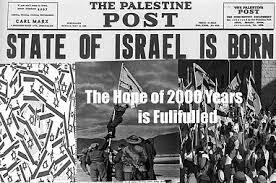 In the 18th century, the possibility of a new birth of Israel was remote and had been remote for about 2,500 years. Occasionally, those pesky prophecies predicting Israel's return to the world scene would raise their heads; but the intelligentsia, like Thomas Paine, scofflawed the possibility. It was not reasonable to think such a thing. For 2,500 years the mythologists had thrown those prophecies around, yet Israel remained stateless and scattered. "In that day, I will restore David's fallen shelter- I will repair its broken walls and restore its ruins- and will rebuild it as it used to be, so that they may possess the remnant of Edom and all the nations that bear my name," declares the Lord, who will do these things. "The days are coming," declares the Lord, "when the reaper will be overtaken by the plowman and the planter by the one treading grapes. New wine will drip from the mountains and flow from all the hills, and I will bring my people Israel back from exile. Israel's labor pains in 1948, as mentioned by Isaiah, were great and immediate; and labor pains were also mentioned when Jesus was explaining the last days to his apostles. They too will be great. The Arab and Persian (Iran) world were in dismay and disarray, much as they are now, that Israel would be given back most of their land from the time of King David and Solomon. Ismail Haniyah, head of the Hamas government in Gaza: "Our position remains as it is, Palestine from the sea to the Jordan river. We will not agree to two states and not to the division of Jerusalem. I hereby call for terrorism and armed struggle ... We want the uprising to last and continue to let Trump and the occupation regret this decision." Saab Erekat, Palestinian negotiator: "President Trump has delivered a message to the Palestinian people: The two-state solution is over. Now is the time to transform the struggle to one of one state with equal rights for everyone living in historic Palestine, from the river to the sea." Mahmoud Abbas, president of the Palestinian Authority: "These measures are a reward to Israel's violations of international resolutions and an encouragement for Israel to continue its policy of occupation, settlements, apartheid and ethnic cleansing." Ayatollah Ali Khamenei, Supreme Leader of Iran: "Their announcement of Quds as the capital of Occupied Palestine proves their incompetence and failure. In regards to Palestine, they are helpless and unable to achieve their goals. Victory is for the Islamic nation. Palestine will be free, and the Palestinian people will be victorious. The modern-day pharaoh is represented by the U.S., the Zionist regime and their accomplices in the region, who seek to create wars in our region, and this is plotted by the U.S. ... The Islamic world will undoubtedly stand against this plot and the Zionists will receive a big blow from this action and dear Palestine will be liberated." The very day Israel became a country, they were attacked and invaded by 5 Arab, Islamic countries. As the Egyptian Air Force bombed Tel Aviv, neighbors Lebanon, Transjordan (Jordan), Syria and Iraq invaded the new country. This, as we know, turned out to be a big mistake for the invaders. Throughout history, including ancient Israel, the Arabs have usually come up short in their fights with Israel. Everyday, Israel looms closer to another war from her neighbors; and it looks like Russia will be invited next time. It is interesting that the prophets who described the final war, knew it would be in Israel.